Sketching is a powerful tool to explore, structure, express and communicate your thoughts. Unlock the super-power of adding images and visual structure to your words to make the world (literally) see what you mean. 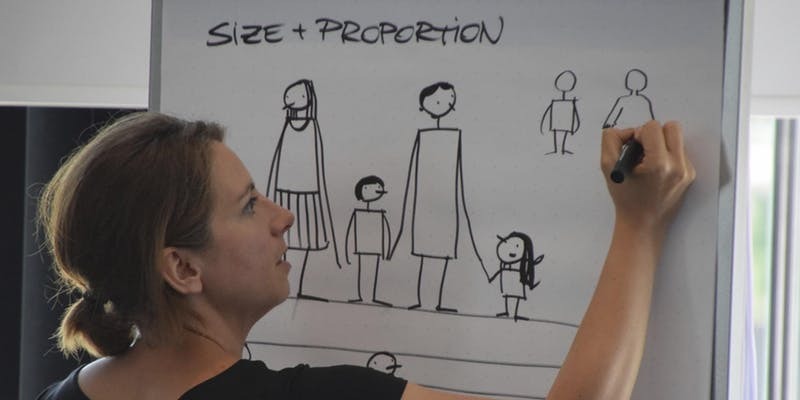 I am teaching two workshops in London on the 15th and 16th of November that dive deep into the topic of sketching as a practical tool for anyone involved in designing, planning and making things. Rapidly develop and iterate website designs and app interfaces, alone and in groups. This workshop is focussed on sketching interfaces, layouts, interactions and flows. We will go through a mix of hands-on exercises, critique and underlying theory that dives into topics like choosing the right level of fidelity, creating visual structure and clarity, use of colour, annotations and sketching with a group. You'll learn how to use sketching as a tool to support your own thinking process and to share your concepts with you team in a clear and engaging way. This workshop takes the boundaries beyond just “boxes and arrows”. You’ll learn a simple framework for sketching anything you need to express and idea or tell a story: objects, people, actions, emotions and abstract concepts. We’ll then dive into different ways of structuring information so that important ideas stand out and patterns and gaps become visible. The two workshops complement each other perfectly. Contact me to get a discount when booking both workshops. I am also reserving two tickets for each workshop for students or people with low income at a very discounted price. If you're interested, let's talk.